Haben Girma will give a presentation to campus staff from noon to 1 p.m. on Jan. 18 and a talk for the campus community from 4 to 5 p.m. Both are free and open to the public. They will be held at the Kresge College Town Hall. Use captions on all videos and make sure that you purchase videos with closed or open captions and audio description. Use Sensus Access, a tool to convert documents found on the UCSC website. Post course textbook lists early so the Disability Resource Center can cut and scan textbooks into accessible documents for screen readers and text to speech. Use a microphone when possible so the audience in lecture hall can clearly hear. Avoid sound drop-offs and background noise. Create presentation slide images and website images with alt tags so screen reader users (people who are blind) can know what others are seeing. Additional faculty support for accessible course design can be found at the Faculty Instructional Technology Center (FITC), an IT resource for faculty. Internationally acclaimed inclusion advocate Haben Girma, the first deaf-blind person to graduate from Harvard Law School, will be at UC Santa Cruz Wednesday, Jan. 18, to encourage campus discussion about inclusion and access through design and technology. 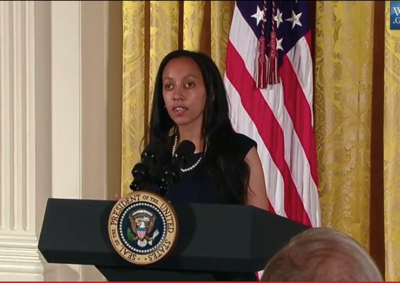 Girma, who speaks persuasively about the role of technology in opening up the world to people with disabilities, has received awards from two U.S. presidents for her work championing equal access to information for people with disabilities. She has been named on Forbes’ “30 Under 30” leadership list and as one of BBC’s Women of Africa Heroes. “We’re amazingly fortunate to get her here,” said Ricki Carr, chair of the campus Staff Diversity Group, one of the organizers of the event. Girma’s campus presentations will be accompanied by an exhibit, Allies For Inclusion: The Ability Exhibit, a traveling interactive display created by Saint Louis University designed to build awareness about people with disabilities. The three-day exhibit gives visitors an opportunity to experience new ways of being in the world and highlights efforts by the disability movement to change the way people design things. The greater community is invited to attend Girma’s talks and visit the exhibit at Kresge Town Hall on campus. There have been significant efforts to improve accessibility through design throughout the UC system. At UCSC, by November of the fall term, 1,578 students had contacted the Disability Resource Center about services and more students have been identified that may be eligible for assistance. The question is how do we design differently so we are inclusive of all people? “We don’t always consider the environment that we design for people and the obstacles it can create,” says Rick Gubash, UCSC Disability Resource Center director and a co-organizer of the event. For Girma, who listens to people via a digital braille display machine and explores the internet through content that is tagged with text, technology plays a key role in her ability to participate fully in her work and with society. On campus, the focus is on all intersections of access. Efforts are underway at the systemwide level to improve the accessibility of UC web content. Some people need captions on videos; others benefit from universal design best practices that involve adding text to digital documents, adding additional testing time in courses or providing a less distracting learning environment. Campus bridges can be smoothed and elevators, modernized. For some people, having a short break in the day between classes makes it impossible to reach a course located across campus. In student housing, three people to a room is manageable for about 90 percent of the community, but 10 percent might have social-related disabilities such as anxiety, post-traumatic stress disorder or depression and may need a quieter environment. More than 40 percent of the people served by the Disability Resource Center has a psychological disability as a primary disability. Beginning this winter quarter, Gubash and Jaye Padgett, interim vice provost for Student Success, are reaching out to faculty departments to discuss how to design future courses with accessibility considerations at the outset. The goal is to eliminate the need for many later accommodations by improving accessibility by design. Contact him to schedule a meeting at rgubash@ucsc.edu. Wednesday, January 18, noon–1 p.m.
Wednesday, January 18, 4–5 p.m. Both talks are at Kresge Town Hall and open to the public. 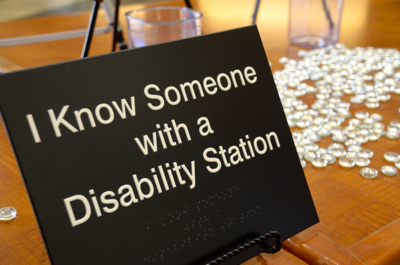 The Ability Exhibit is a traveling interactive display created by Saint Louis University designed to develop allies for people with disabilities by building awareness about people with disabilities and the disability movement. It will be in the Kresge College Town Hall. Tuesday, January 17, 12–6 p.m.
Wednesday, January 18, 10 a.m.–6 p.m.
Thursday, January 19, 10 a.m.–3 p.m. If you have a disability/access/dietary-related need, please contact the Disability Resource Center at 831–459–2089. So that everyone may enjoy this event, please refrain from wearing scented products. Sponsors include: Student Fee Advisory Committee, Disability Resource Center, Office of Diversity Equity and Inclusion, Staff Diversity Group, Kresge College, UTC/The Village, Campus Housing and Educational Services and Diversity and Inclusion Programs.